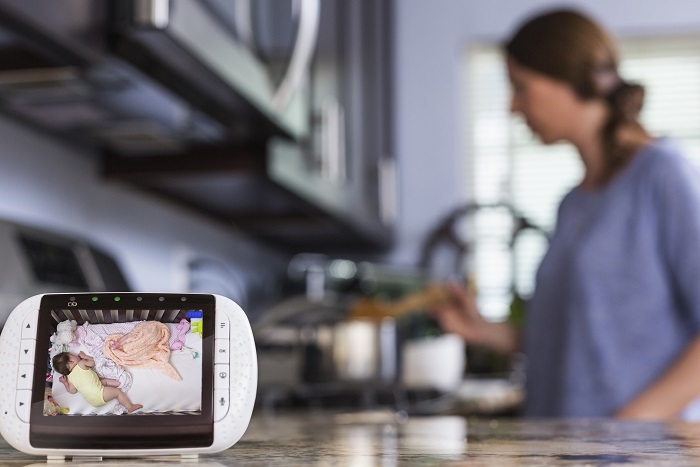 Are you in the midst of preparing for the arrival of your little one, making a list of all your baby necessities and like many first-time parents your are faced with the dilemma of whether you need a baby monitor or not? Well, when one thinks of all the accidents that can happen when a baby is left unmonitored, it becomes clear just how important baby monitors are for the safety of your child. As a parent, you want to make sure your little one is safe at all times and placing a baby monitor in the nursery is a great way to keep an eye on your baby when he/she is taking a nap. It really is a convenient device that allows you to take care of household chores while keeping track of your baby. But, how exactly these devices keep track of sleeping babies? All baby monitors feature a transmitter, which is installed in the nursery, and a receiver, that you can carry around while getting chores done. It’s important to mention that not all monitors are created equal. There are various types that have different features and uses. The most commonly used one is the sound monitor, designed to pick up and transmit any noise coming from the nursery. There are also video monitors that not only transmit sounds, but allow you to see your little one and check whether he/she has woken up. Next, we have the breathing monitor which usually features a mat that is placed under the baby to keep track of the baby’s breathing. If the baby hasn’t breathed for a while the parent is alerted through an alarm sound. Safety is of course the main reason why parents decide to get a baby monitors, but there are many other reasons why this practical device should be on your list of baby necessities. Babies that are 1 to 3 years of age should get 12 to 14 hours of sleep each day. A baby monitor allows you to keep track of your baby’s sleep and check whether he/she is getting enough sleep. Video monitors, in particular, are great for this purpose because they allow you to see if your baby is tossing and turning too much, which is often an indication that he/she needs a diaper change or is hungry. Being a new parent can be exhausting and to be able to take care of your child properly you need to take some time to relax, rest and restore your energy. Lack of sleep is often the main cause of depression and stress, especially for first-time parents. The practical baby monitor is here again to save the day. The perfect time to get some sleep is during your baby’s nap time. Just place the baby monitor beside your bed knowing that the device will alarm you when your little one wakes up. It’s naturally to feel a bit nervous when you lave your little bundle of joy alone with a nanny for the first time. Will she feed him/her properly and keep him/her entertained? Will she change the diapers and put him/her in bed on time? Video baby monitors can provide the answers to all these questions. Be for an important business meeting or a busy day running errands around town, a baby monitor provides you with live video feed of your little one while you’re away from home. So, you can check at any time whether the new nanny is taking good care or not.